This Luosto holiday has it all! You can slow down and lose yourself in wilderness surroundings when on a reindeer sleigh ride or trekking on snowshoes after the Northern Lights. Enjoy the thrill of travelling by dogsleds and snowmobiles, and zoom over cross-country skiing paths. On top of all that, you’ll be able to hunt for gemstones in Lampivaara Amethyst Mine. Get an introduction to a wide range of Nordic activities during this excellent seven-night holiday to Luosto, Finland. Try traditional Finnish pastimes such as cross-country skiing and dog sledding. Take a snowmobiling trip to the Lampivaara Amethyst Mine and hunt for the Northern Lights with an expert guide. Our Taster Week in Luosto takes you right into the heart of a beautiful landscape, giving you the chance to take part in a full range of Nordic activities, all while finding out more about the local culture. Get familiar with the winter wonderland around Luosto on snowmobiles - easily one of the most popular ways to get about in Finland. You will drive them all the way to the famous Lampivaara Amethyst Mine, where you will be able to dig for your own amethysts. Connect with nature as you learn how to cross-country ski on delightful trails. 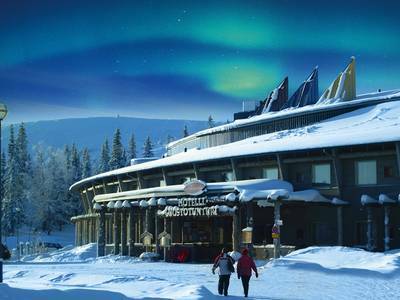 As Luosto is right inside the Aurora Zone, a snowshoe hunt for the Northern Lights has been included in your itinerary. There is also the chance to add in extra evening activities if you would like to further enhance your knowledge of the Aurora or your chances of seeing the Northern Lights. There are two Arctic animal experiences that simply shouldn’t be missed in this part of the world. You will harness up the huskies to a sled and follow a guide on a ten-kilometre dog sledding trip through the wilderness. You will also travel to a reindeer park and observe how this traditional industry continues to the present day before enjoying a sleigh ride. You will stay at the Luosto Tunturi Spa Hotel which has a wonderful pool area, spa and gym, and well-being facilities for guests to enjoy during their stay. Please note: If you are travelling over the New Year then you will be joining in with the hotel’s wonderful celebrations. These will normally include a celebratory meal and live music on New Year’s Eve. Please ask our Travel Experts for further information. Please note: this is a sample itinerary which will vary depending on the arrival day of your holiday. All activities are subject to availability at the time of booking. On arrival at the airport, you will be greeted and transferred to Luosto. You can check in and familiarise yourself with your inviting hotel room before dinner in the restaurant. If you are arriving on a later flight a packed tea will be provided on the transfer or a chilled supper will be waiting in your accommodation upon arrival. After breakfast, it’s time to meet some of Lapland’s most famous inhabitants. A short transfer to a local reindeer farm will be followed by an introduction to this centuries-old and traditional way of life. You will also be treated to a reindeer sleigh ride taking you along pretty forest paths. Tea and coffee will be served at the farm before you return to Luosto. Dinner will be served in your hotel’s restaurant. Following breakfast, you will have a free day to make the most of Luosto as you wish. You could make use of the spa facilities or book activities locally and head out over the snow. Dinner will be served in your hotel’s restaurant. Cross-country skiing is one the most popular pastimes in Finland during the winter and Luosto is well known for its routes. After breakfast, your guide will provide tuition prior to leading you on a ski trip along some delightful trails. After breakfast, you will go on a snowmobile safari to Luosto’s famous Amethyst Mine, based on the top of Lampivaara Fell. Having been shown how to control the snowmobiles, you will drive through the wilderness and along snowy forest routes. The trip is based on two people sharing a snowmobile and anyone wishing to drive must have a full driving licence. If you would prefer not to be on a snowmobile, you can choose to sit in a sled pulled by the guide’s snowmobile. It is also possible to upgrade to single snowmobiles if you would prefer to drive your own. Please ask our Travel Experts for more information and a quotation. At Lampivaara, you will learn more about the history of the Amethyst Mine, prior to journeying to a covered section of the mine to seek out a gemstone of your own. If you uncover one which is small enough to fit inside a closed fist, you can keep it! You will then drive the snowmobiles back to Luosto. Today you will have the morning and afternoon at leisure. You might like to get back on the cross-country skis and snowshoes and explore more of Luosto’s landscape or to try something new. A lazy day at the hotel is also possible if you prefer to completely relax! Dinner in the hotel restaurant paves the way for a Northern Lights snowshoe hunt. Led into the tranquil night by a guide, you will walk and look for the Aurora as you go, with a hot drink served en route. A free morning gives you time to try out the snowy outdoor trails after breakfast. The afternoon kicks off your itinerary with your final holiday highlight: the 10km husky safari. You will be transferred to a husky farm where you will meet the dogs and receive full instruction on how to handle a team. After that, you will be off on an exciting ride around Luosto’s surroundings. On your return to the farm, you can learn more about these splendid dogs from the mushers while sipping drinks by a fire. This is sure to be a truly unforgettable experience. Enjoy a final breakfast before you are transferred to the airport for your flight home. 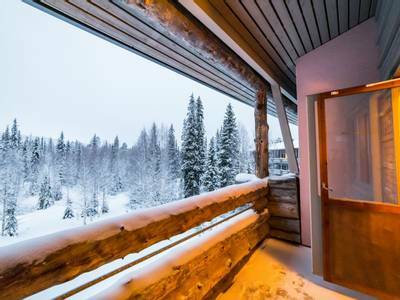 The Luosto Tunturi Spa Hotel is one of only two hotels in the town and continues to be one of our most sought after accommodation options. The hotel combines 150 comfortable bedrooms in varying room types, with a swimming pool, spa facilities and three restaurants. The restaurants at the hotel serve an array of local and international dishes. The main Tunturi restaurant, used for the majority of our trips, serves buffet style meals. The meals often include choices of one or two dishes and local specialities for evening meals. There is also the Bistro restaurant, which is smaller and serves à la carte meals. Finally, the Kelo Log Restaurant, just a short walk down the road, is a vast log cabin restaurant and is used in some of our programmes one evening. There are seven neighbouring downhill ski slopes and ski hire is available locally. 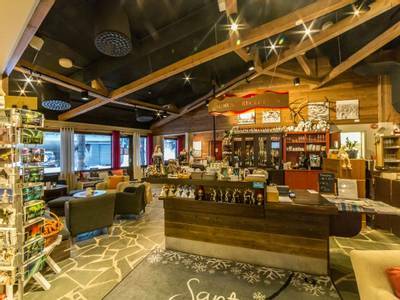 The hotel will also help you arrange ski passes. Also cross-country skis and snowshoes can be hired locally for you to explore the variety of trails surrounding the hotel. Superior double/twin rooms: The superior rooms are similar to the standard rooms but are all in the new wing of the hotel and have been recently renovated. All rooms have an en-suite toilet and shower room and other facilities including a hairdryer, a drying cupboard, a minibar and television. In addition, there are tea and coffee facilities in each room. Upgrade supplements will apply - please speak to our Travel Experts for more information and a quote. 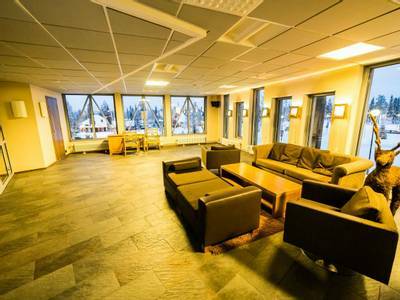 The Tunturi and Amethyst suites: The hotel also has a small number of suites for guest use, which are ideal for those looking for a bit more space. The twelve Tunturi Suites each have one bedroom for two people. The three Amethyst Suites have two bedrooms and accommodate up to six people. All the suites are equipped with a lounge area, a kitchenette, shower room with private sauna, a hairdryer, a television, a drying cupboard and a balcony. Get fully immersed in the science, myth, and legend behind the Northern Lights with an expert-led audio-visual show. This will have you fully prepared for the Aurora hunt that follows, with a guide taking you to a special outdoor spot for watching and taking photos. Camera tripods will be available and hot drinks will be served by a campfire. NB: This is a very similar presentation to the one included in the visit to the Aurora Kota; we do not, therefore, recommend booking both of these activities. 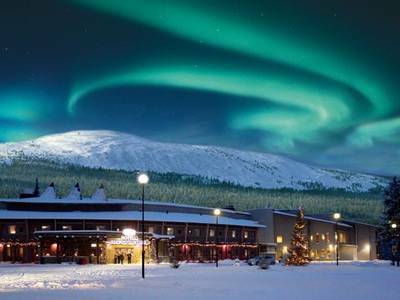 You will transfer to the Aurora Kota for an engaging presentation on the Northern Lights. A ‘kota’ is a typical tent used by Finland’s native Sámi people and makes for a highly atmospheric venue; this version is crafted from wood so it is nice and cosy. NB: This is a very similar presentation as included in the Multimedia Show and Northern Lights hunt so we do not recommend booking both of these activities. Having been shown how to safely operate a snowmobile, you will follow your guide through frozen forests and the Lapland countryside to a specially chosen spot on an icy lake. Here, you will be taught how to drill through the ice and set up a line. Then it’s just a matter of patience to see whether you make a catch! Your guide will offer insider tricks and tips, and coffee will be served with a snack by a campfire. Please note: the arrival day of this holiday changes depending on the date of travel chosen and the available flight routes. Because of this, the order of activities is a sample of how they may run and as a result, it may change. Your final itinerary will be provided to you upon arrival at Luosto but all will be included in your holiday (subject to availability). The activities were all great in different ways - the programme was varied and fun but did leave enough time for relaxation. The Lapland safaris guides were fantastic and gave a great introduction ensuring we had lots of fun and learnt about our activities but stayed with us at the same time. I think everything was fully covered within this holiday. There is enough time for activities and own time. The Huskey safari was the best, as this opportunity won't come around again. It was an exhilarating afternoon. I have already recommended artisan travel for a winter activity holiday and would definitely book through yourselves again! Read more the reindeer sleigh ride itself, just because it was very sedate. However, the talk given by the Reindeer 'farmer' was most enjoyable and very informative giving a great insight into a year in the life of a reindeer 'farmer'. A big shout out must go to Greta Henderson, the rep at the LoustoTunturi Hotel, for not only a very friendly welcoming and informative briefing about what to expect from the activities, but also her continuity throughout the week with regards to any queries or questions we had and that they were answered or actioned to our complete satisfaction. This was evident one breakfast time when we got chatting about a local ice skating sign we had seen near the hotel and Greta actually interrupted her breakfast to go seek information from another colleague in the restaurant. I’m in no doubt that Greta's enthusiasm to help enhanced our holiday experience. Read more very friendly and extremely helpful even spending the time to look into additional activities like ice climbing, she even introduced us to a colleague who had previously ice climbed so that we could gain more details. Nothing was ever too much trouble and we would say that she is a great asset to your company. Please send her our regards. Thank you again for a really memorable trip! All of the activities were very enjoyable and we had the most amazing time. Luosto is a very special place to be in the winter. We were provided with an accurate description of the holiday and were very well informed of what we would experience. The holiday surpassed both of our expectations and it truly was a 'once in a lifetime' experience. The activities were all good but we did enjoy the cross-country skiing and the snowshoe trek. This was our 2nd trip to Luosto and we have already recommended it to all our friends. Just returned to England after a great week in Luosto. Despite not having seen the Northern Lights we had great fun. A massive thank you to Graham and Karen who did a fab job out there. We enjoyed our cabin and even managed to get the fire going! No hesitation to recommend your company. We had a great time in Luosto with the multi-activity taster trip. Everything ran like clockwork, and looking back now at the pictures much of the magic is preserved. We didn't see the Northern Lights but it still made for a superholiday. Read more words how impressed I was with them. Everyone was very friendly and very helpful. The equipment they provided was in great condition and they were happy to loan absolutely anything we needed. The hotel was very nice; having a north facing room was a great bonus. I thought the food was of a high standard.The holiday was brilliant and I really want to do the whole thing again! The most perfect week ever.All of the activities were great. We really enjoyed doing a taster trip and taking part in activities we might not have chosen ourselves.